Jumping into an RV and hitting the open road full-time would create an adventurous and exciting chapter in your life story, but such a commitment requires a bit of planning. After all, leaving your spacious, permanent place of residence to live and travel in a smaller RV is not something to do spur of the moment. If you’ve considered living full-time in an RV, there are a few things that you should know before committing to the adventure. Full-time RV living requires a minimalist mindset. Gone are the days of extra room and storage space. While homes typically come geared with basements, garages, large closets or other means of storage, RVs lack this extra space. You should plan on using less items with multiple purposes as well as investing in furniture that doubles as something else. Your kitchen table can double as your office desk and your sofa can double as your new couch. As a full-time RVer, your focus must switch from wanting to purchase more belongings to figuring out how to get rid of what you own to create more space. 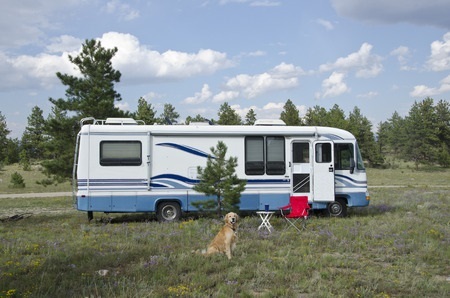 Living full-time in an RV requires basic mechanical skills; after all, you must keep your mobile home running and in top shape to continue traveling. Learning some valuable skills in electricity, plumbing, and basic maintenance will save you time and money down the road. Know how to perform basic maintenance tasks such as repairing roof and window leaks and develop a chore chart for weekly cleaning. Also, gain some experience handling basic plumbing issues. Don’t forget to spend some time reading your RV manual. Consider insurance and roadside assistance to cover your back when incidents occur. Roadside assistance programs give you peace of mind for when your RV breaks down or experiences other issues. Traveling in an RV full-time means you can live almost wherever you want for as long as you want. You can park somewhere for a few weeks and leave as desired to go to a new location. This freedom is part of the draw of full-time RVing; trading in a stationary home for the chance to travel the country. Where you can legally stay depends on the state; for example, some stores will let you stay in their parking lot for a night. Do your research before attempting to stay in a new location. Keep in mind you still need a permanent legal address for things like your driver’s license, voter registration, and vehicle inspections. Consider taxes and insurance rates when deciding your permanent residence. Ready to make the switch to full-time RV living? Find all of your RV lamination, siding, and storage needs at Hemet Valley RV, the leading provider of trailer siding and RV storage since 2005.